When God breathed the breath of life into us, he made us perfect. The Man God Made was strong, creative and noble, devoted to the path of God. But ever since Adam succumbed to temptation in the Garden of Eden, many of us have fallen below that standard set by God. Pastor Oghenethoja Umuteme of the Royal Diamonds International Church in Nigeria tells us in his new book how we can renounce evil and regain that path set for us by God, becoming once again the men and women God intended us to be. The book enables us to understand the qualities expected of those who would live life to its fullest and reach Heaven. These qualities will enable them to follow Christ’s ways and minister His word to the world, wherever they may be. The Man God Made has been written to bring out the best in all. Pastor Oghenethoja Umuteme of the Royal Diamonds International Church in Nigeria tells us in his new book how we can renounce evil and regain that path set for us by God, becoming once again the men and women God intended us to be. 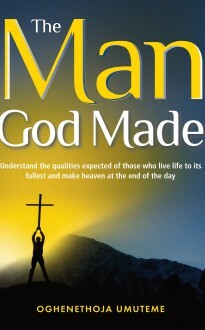 The book enables us to understand the qualities expected of those who would live life to its fullest and reach Heaven. These qualities will enable them to follow Christ’s ways and minister His word to the world, wherever they may be. The Man God Made has been written to bring out the best in all.